Question2Answer is an open source program published on 4th February 2010 with license GPL V2+ and written in PHP language. Easy to integrate with existing WordPress site and users. Plugins and themes available for more customization. Most of the plugins are not working as expected. Developed using Python language and it is an absolute clone of “stack overflow” site with minimal features. AnswerHub is the powerful and full featured pro version of OSQA. Reliable – AnswerHub will keep OSQA script live and running since this is like a trial version of them. Difficult to install and setup. LampCMS was written in PHP and licensed under LGPL V3. Very powerful and contains almost all the features in popular sites like stack exchange and quora. Supports forum features like “Sticky threads” and “dot folders”. Integrate with social networking sites. Coordino was written in PHP and used “cakePHP” framework. It works fast with very minimal feature. 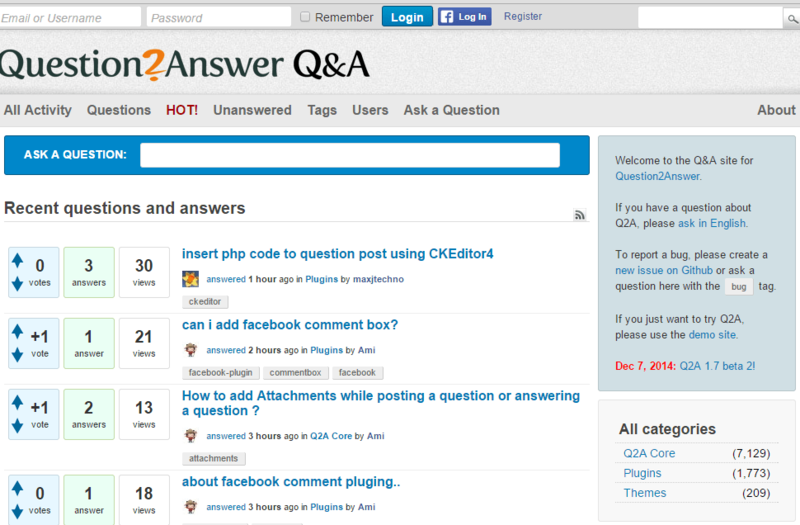 Users can post question and answer anonymously. Qanus is an open source Q&A script used for testing purpose. Easy to test and develop. All the above mentioned Q&A scripts contain their own unique features and options. I will recommend using “OSQA” and “Question2Answer” script which was reliable currently and hope in future too. You have any other recommendation? You know some other open source Q&A scripts? Let us know in the comments below.